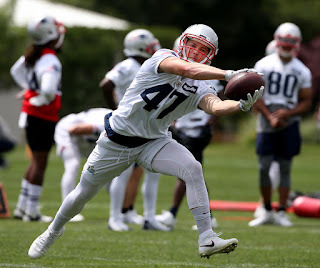 New England Patriots’ tight end Jacob Hollister is off to a great start this year. After appearing in just 86 offensive snaps (7.55 percent) last season, the second-year player could see his field time increase this season thanks to hard work and persistence. Hollister is catching the eye of his coaches and drew high praise from Bill Belichick ahead of Monday’s stadium practice for season ticket holders. "Jacob improved a lot last year and he's gotten off to a good start this year from the offseason program to our spring workouts to the start of training camp. He's still got a long way to go. He has a lot of football in front of him. 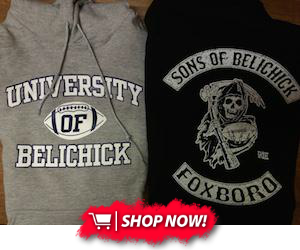 He didn't have a lot of experience - had some - but has gained a lot and will gain a lot more," Belichick said. "I think he's got a great future. He works hard, he's a tough kid, he plays hard, practices hard and has become much better at his fundamentals and techniques at his position." Hollister is slowly transitioning from being more of a special teams guy to a potential target for quarterback Tom Brady. The tight end joined Brady, James White and offensive coordinator Josh McDaniels for small group passing work at Saturday’s and Sunday’s practices. "It's awesome getting some one-on-one time with James and Tom, being able to learn from guys like that. Any opportunity to get extra work, whether it's getting one-on-one time with Tom or learning from those older guys is a great opportunity," Hollister said. "Obviously you want to get as many reps as you can with the starting quarterback, but at the same time I'm trying to get as much reps as I can, whether it's with him, Hoy (Brian Hoyer) or Danny (Etling)." "I'm just trying to do whatever they want me to do. Whether that's all special teams, blocking, catching the ball, I'm trying to do whatever the team needs me to do," he said. "I'm just coming out trying to learn like I did last year. It's a fresh start every year. I'm trying to relearn the offense, learn from the older guys and do my best."